The guys above aren't mine! Sorry about the long delay between articles - but on the plus side I have actually been spending any spare time painting up my paratroopers. I am aiming to get a painting tutorial up... at some point. So as you know from my review I recently picked up my first Flames of War models - the British Parachute Company box set. I want to tell you a little bit about the history and equipment of these troops, and have a look at how this is reflected in their Flames of War briefing. British paratroopers were elite troops, extensively trained and with a variety of experience in battle. They served mainly in the 1st and 6th Airbourne Divisions. They first fought in North Africa, Sicily and Italy in 1942-1943. Because of a reluctance to commit these troops to battle, and some issues with the weather, they were then on stand by for a period of about one year before they returned to active duty. In battle they were brave and honourable opponents. These guys would eagerly engage the enemy no matter the odds. There are two major late war engagements in which the British paratroopers were involved. The first was D-Day, where they dropped in to France the day before with the goal of securing strategic positions and taking out artillery positions. Unfortunately they were scattered on the drop, but managed to recover and achieve some great victories. Eventually they were withdrawn back to England. Then, after many delays, they were dropped deep into Holland at the forefront of the Market Garden campaign. This was a poorly managed operation that ended badly, and many of the soldiers were slain. However, after a heroic few days of intense battle, the survivors managed to successfully withdraw. They would then have participated in the less glamourous march to Berlin at the wars end. So Fearless Veteran is a wholly appropriate rating for these troops. This means that I have an army that is very tough to hurt when concealed, especially in bullet-proof cover where they only get hit on a 6+. Also I have a good chance of making motivation checks, especially with a re-roll from the HQ (or the British Bulldog national rule). There are several different briefings for playing my paratroopers with. I have looked at the list from Turning Tide, and bought the A Bridge Too Far one. All of these briefings are strictly Late War. Apparently the North Africa book has a list, but i haven't seen it. Hopefully it is very similar, so that I can play in mid-war too! The main difference between the late war briefings are in the divisional support available - some include tanks whilst others focus on Airlanding anti-tank and artillery platoons. Air Support also varies from Sporadic to Priority, though it is always Typhoons. The paratroopers were armed with the best quality equipment the British army could provide - of course this doesn't exactly shine compared to the American and German equipment, but at least most of the weapons were reliable. The majority of the men were armed with the ubiquitous Lee Enfield rifle, a gun dating back to the previous century. This bolt action rifle was slow to fire but very reliable and robust. About 1 in 3 instead wielded the sten gun, a very simple proto-sub machine gun. Each squad of 10 had a single Bren machine gun. Additional weaponry was carried by the squad. Each member would carry a bag of explosives that could be used as an anti-tank bomb, or pooled together to destroy bridges etc. Also each squad would include a single light mortar, in addition to the mortar support provided at the company level. Flames of war abstracts the firepower of machine guns into that of each Rifle/MG infantry stand of 4 figures. 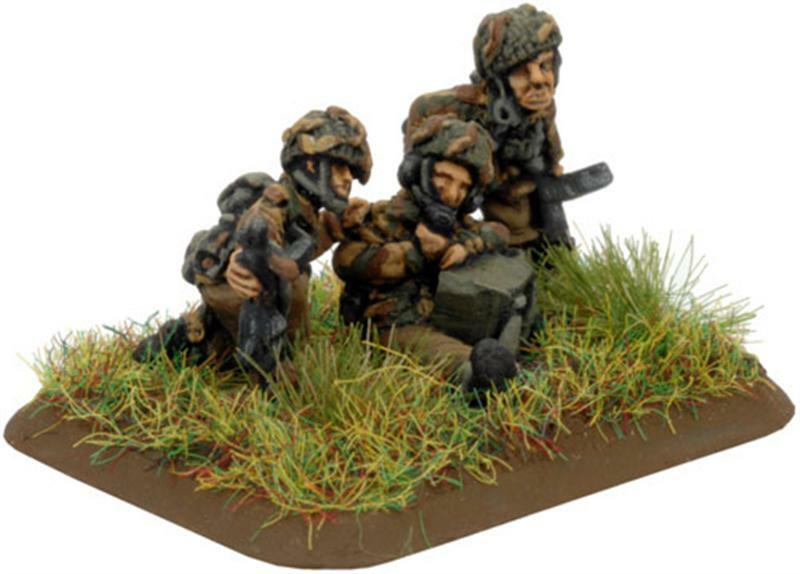 Even though only 1 in 10 paras were actually armed with the Bren, this is an abstraction that I don't mind. These days I am looking for games that model outcomes, I'm not interested in simulating the details. The only squads with SMGs are some command stands. Even though about 1 in 3 soldiers were armed with the Sten gun SMG, they didn't field SMG platoons to my knowledge. So once again, abstracting the Sten guns into the regular squads is still OK with me. All the paratrooper squads carry Gammon bombs, which give them Tank Assault 3. This allows them to destroy most tanks, and even gives the possibility of bailing out a Tiger! Finally, every turn, one stand in each paratrooper platoon can fire smoke as of they were a light mortar. So overall they do a good job of modelling the fluff IMO. Stand by for my next post, where I go through my army list ideas and some (naive) thoughts on strategy.